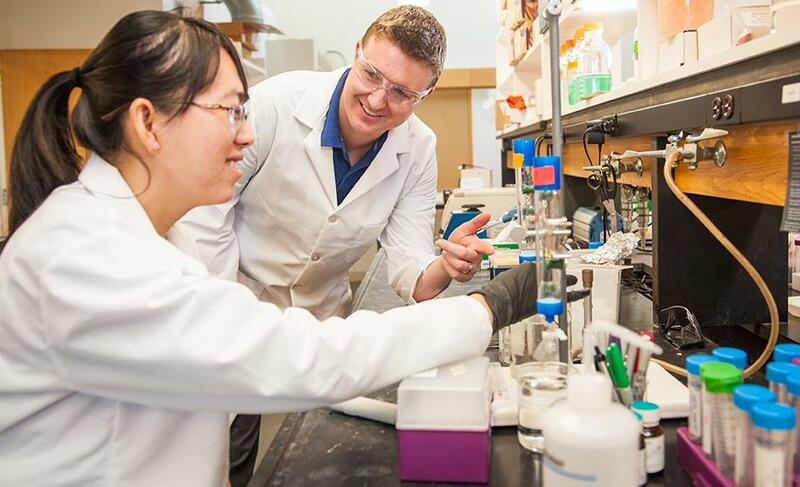 Yaya Wang works in the lab of Donald Spratt, Carl J. and Anna Carlson Endowed Chair and assistant professor of chemistry and biochemistry in the Gustaf H. Carlson School of Chemistry and Biochemistry. A doctoral candidate in biochemistry and molecular biology, Yaya Wang spends hours each day conducting research experiments at Clark University. She’s a steady, calm presence in a laboratory bustling with undergraduate students, working alongside Donald Spratt, Carl J. and Anna Carlson Endowed Chair and assistant professor of chemistry and biochemistry in the Gustaf H. Carlson School of Chemistry and Biochemistry. Like Spratt and the undergraduate students she mentors, Wang studies the protein ubiquitin, present in most cells in humans and other living organisms. Currently, Wang is examining how certain enzymes, HECT E3 ubiquitin ligases, control ubiquitin’s interactions with other proteins. Although her research is complex, her goal is simple: to produce findings that could make an impact on global public health. Wang’s previous research examined the biochemical activities of a type of hemoglobin found in both the marine bacterium Rosoebacter denitrificans and in Mycobacterium tuberculosis, the bacteria that causes tuberculosis. Her findings could lead to an alternative strategy to treat the life-threatening disease. Wang came to Clark from her home province of Shanxi, China, because she wanted a smaller research institution where she could get to know other students. In particular, she has appreciated the broad diversity of her fellow students’ backgrounds and experiences. After graduating this summer, Wang hopes to find a post-doctoral or faculty position where she can both teach and conduct research. “I think my time at Clark will make me more competitive and more prepared,” she says.